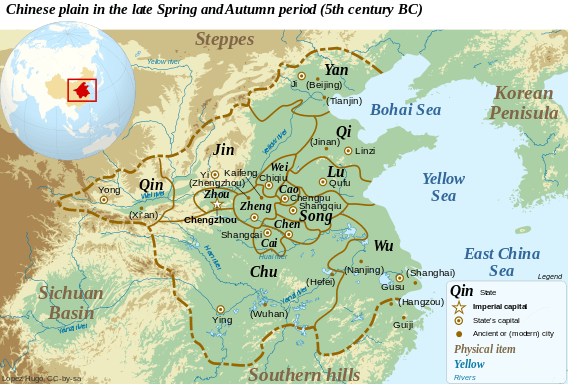 Chen (陳) was a Zhou dynasty vassal state of ancient China. Its capital was Wanqiu, in present-day Huaiyang County in the plains of eastern Henan province. According to tradition, the royal family of Chen were descendants of the legendary sage king Emperor Shun. After the conquest of the Shang dynasty in 1046/45 BC, King Wu of Zhou enfeoffed his son-in-law Gui Man, a descendant of Shun, at Chen, and Man became known as Duke Hu of Chen. Chen later became a satellite state of Chu, fighting as an ally of Chu at the Battle of Chengpu. It was finally annexed by Chu in 479 BC. Many people of Chen then took the name of their former country as their family name, and account for the majority of Chinese people with the family name Chen today. After the destruction of the old Chu capital at Ying, Chen became the Chu capital for a period.